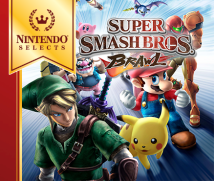 Every time we add to the series, we increase the number of characters, and Smash Bros. Brawl has pushed this to the limit. However, I think it’s best if our players let the Smash Bros. Dojo website attest to that fact. I would, however, like to touch upon two of the new characters, Snake and Sonic. Clearly these two are the very first guests to the world of Nintendo. Correct. I know I’m the one who’s being interviewed, but I’d like to ask you how Nintendo felt about having outsiders in the game. You mean, whether or not it was okay? Everyone understood for the most part since that’s the nature of Smash Bros. However, there were debates about where to draw the line. For the most part though, it was readily solved since we were comfortable that you were in charge for the selection. I myself thought it was best to make the game as inclusive and entertaining as possible since festive opportunities like Smash Bros. only come along once in a while. I’m glad everyone felt they could trust me. For my part, I have no regrets about incorporating Snake and Sonic into the game and I think their inclusion was well worthwhile. Now that you’ve put them in the game, can you tell me what they’re like? Hmm, what should I say? I think they’re solid characters with a lot of potential. Right. They certainly have a distinct feel to them. It’s not that I was consciously trying to design Nintendo and non-Nintendo characters, but ultimately, I feel they’re moulded differently than the other characters as far as the laws of Smash Bros. are concerned. I was impressed with the end results. They blend in as if they’ve always been there yet also possess a fresh, new aura. Thank you. I think that once you play these characters and learn their moves, you’ll realise how they differ from other characters. Ultimately, they account for characteristics that can’t be obtained simply by increasing the number of Nintendo characters. I was even able to go all-out with their showy performances. What kind of characteristics do you mean? The way they jump for example? After all, Mario’s jump, Samus’ jump, Sonic’s jump - they’re all different, aren’t they? You may not be readily aware of it, but the differences become clear when you take a closer look at the characters. The fact that Smash Bros. is able to put these differences on-screen without drawing attention is not only mystifying, but also one of its unique features. I think you’re right. And it applies to all characters, not just Sonic and Snake, since you’re taking characters with different abilities and putting them all in the same game. Figuring out how each character should interact in this environment is fun every time I do it. But it must be challenging too. After all, you can only pick a limited number of moves and abilities from each character’s arsenal when incorporating them into Smash Bros. This must force you to be extremely careful when looking at a character and choosing how and what abilities you can use. 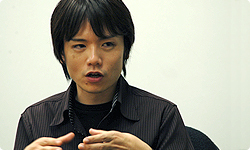 In other words, what you find in Smash Bros. is a concentrated version of the character. Furthermore, you have to ensure the characters are well-balanced. Did you have any difficulties with this aspect of the game? Sure did. It looks better, for example, if fast characters make smooth, clean landings, which in turn, distinguishes one character from another. If you make them too quick, however, they become hard to control and the overall balance suffers. That’s why I worked so hard to adjust each character’s attributes. By the way, about how many different attributes does each character possess? Probably more than I can count. (laughs) I would roughly say that it’s somewhere in the hundreds. That means, for each character, you’re assigning values to hundreds of attributes to both prevent overwhelming advantages and preserve individual strengths. Sounds like incredibly hard work. And one you can’t leave to anyone else. Actually, I think people’s confidence in this part of your job is what enables them to lend you these characters. They’re willing to entrust them to your care because they know that you’ll do a good job. Far from being a burden, it’s an honour.